After successfully climbing Mount Kilimanjaro in October 2012, I honestly thought that I would never attempt to climb another mountain again. Just 12 months have passed since our Kilimanjaro Climb, and while I am sure that most people live on the memories of this extraordinary experience for a lifetime, we soon found ourselves discussing the next ‘big adventure’ and it didn’t take long for the word ‘Everest’ to start popping up in conversation. At 8,848 metres, Everest is a whopping great mountain, and if you want to get to the top, you need buckets of determination, buckets of time and buckets of money! 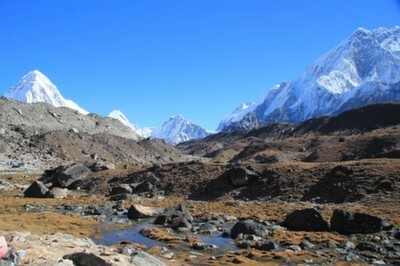 However, there is an alternative for us lesser mortals, and that is to trek to the Everest Base Camp in Nepal at 5,364 metres, a mere 500 metres lower than Kilimanjaro’s Uhuru Peak. Usually packaged as a 14-day or a 17-day tour, trekking to the Base Camp of Everest is no ‘short hop’, but the longer tours generally include stopovers and tours of Kathmandu so you can learn about the people, the culture and the history of Nepal before heading off on your Himalayan Escapade. The thing that appeals to me most about trekking to Everest Base Camp, is that fact that you sleep in Tea Houses rather than tents along the way, and while they are understandably ‘basic’, they are certainly a whole lot more comfortable than the ground! If you have ‘been there, done that’ please tell us all about it! Previous Post Travelling Solo – Top Tips to ensure you never get Lonely! Next Post Have Your Booked Your Flights for Christmas Yet? If not, do it quick! An amazing bucket list adventure for sure! Have been looking into a Nepal trip too. 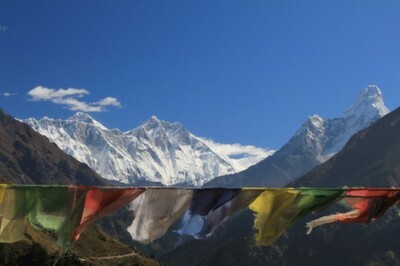 Have you checked out the Annapurna Circuit? Seems to be busy, but I’ve heard it offers more in the way of culture and views than the trek to the EBC. Just a thought. Hey Andrea, thanks for stopping by! Yes, I have been looking at the Annapurna circuit too, but there is just something about Everest that is pulling me in that direction.